Ma che bella ispirazione, mi piace la borsa! You know I love when you do these! You always find inspiring outfits and I always end up loving your picks even more. I can totally see you in this outfit Lilli! This is my kind of spring look as well and I love the F21 bucket bag! I have been on the look out for a fabulous brown jacket like this! I will defenitely check this one out at River Island. Great post hun, thanks for the inspiration. Well done; you've recreated this outfit in a perfect manner! Love the jacket and the bag. Va beh ma qui ti sei superata Lilly..
Ohh, I love that Mango ankle boots. I like that it's a high block heels because it makes it look so chic. Very nice and stylish. 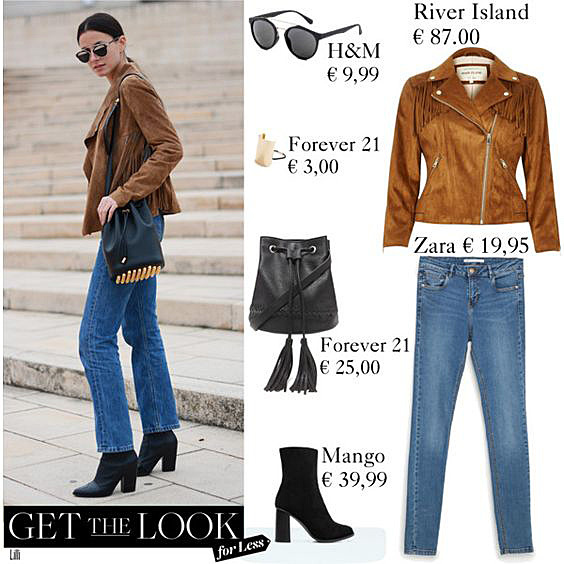 The fringe on the jacket is just right, paired with black boots, it's just perfect. Molto bello questa proposta, mi piace tantissimo! E' un look che oltretutto vedrei benissimo su di te con l'immancabile rossetto rosso!!! You're so good at this Lilli! That is a gorgeous outfit and I love the jacket. Precious fringe jacket, always is good to save some money, not to go bankrupt every season, very good options dear Lilli! Kisses. Brava Lilli, Quanto è bella quella Giacca in suede?